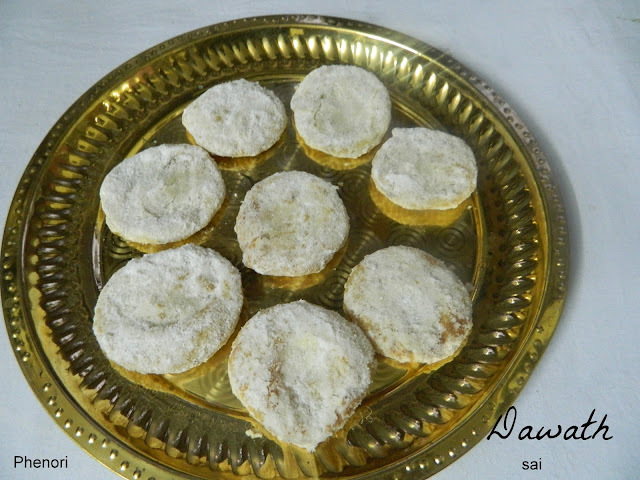 Phenori or sweet puri is a traditional GSB sweet which is a very popular sweet in GSB homes.Home made phenori tastes awesome. 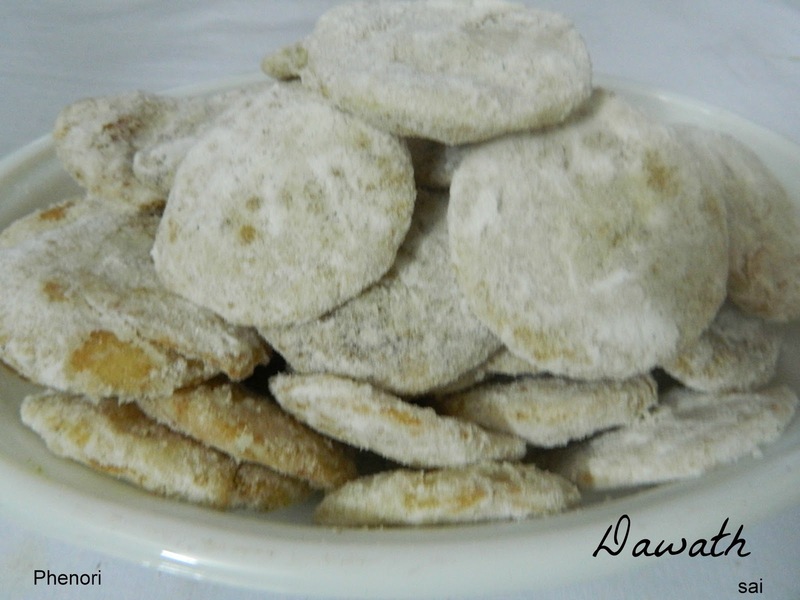 I’ve been preparing it from quite some time.This recipe was passed to me from my Papas cousin N.Her mama in law is an expert when it comes to sweets and savories,so originally this is her recipe.So this recipe I give credit to her.Aayi (granny) used to prepare it often when we were kids and I used to help her around,by applying the mixture and rolling….This batch I prepared on Sanjus demand,since she craved for home made phenoris. Looks lengthy procedure but very easy to prepare. Mix chiroti rawa in ghee and keep it aside. Mix cardamom powder in the sugar powder and keep it ready. Knead the dough with salt,ghee and water just like a puri dough,medium stiff and keep it aside for an hour. 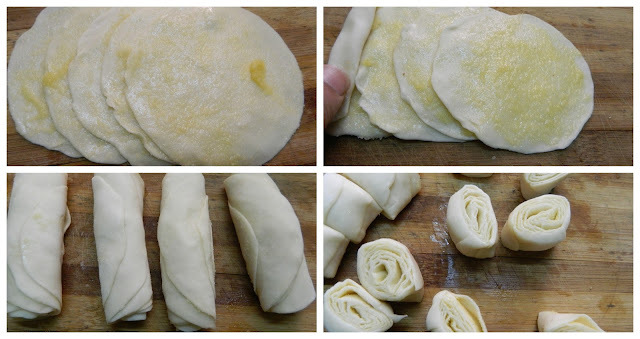 Pinch lemon sized balls from the dough and roll into thin discs( puris). 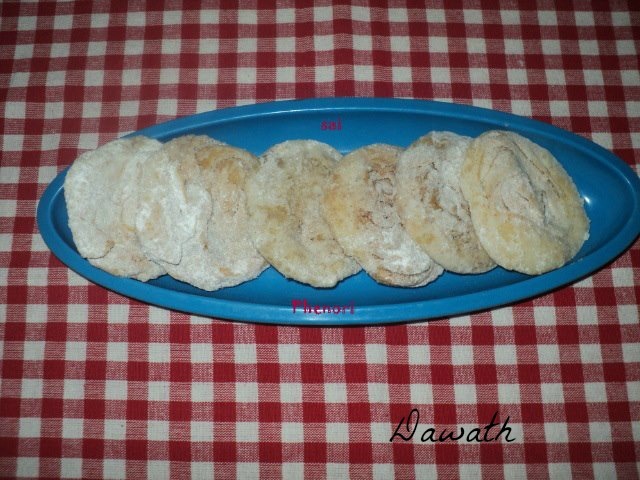 Take a flat board arrange one puri,apply chiroti ghee mixture all over,repeat with 4 more puris. Next step is stack all the 5 puris one above the other(not fully over), (as shown in the picture) and roll it like you roll a carpet tightly(don’t put too much pressure). 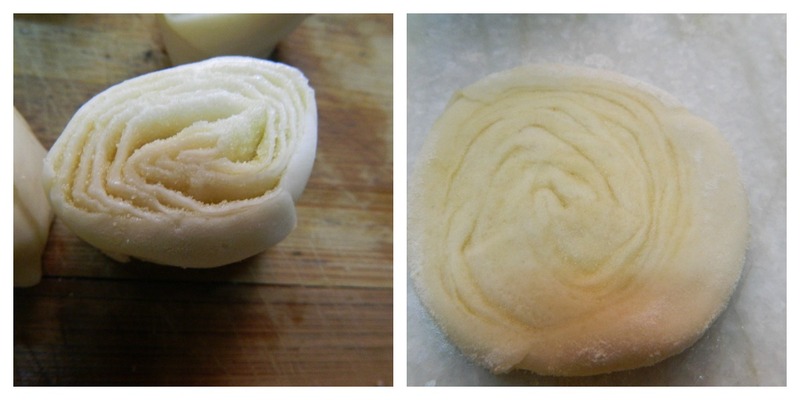 Cut the roll into 1/2 ” pieces with a sharp knife,press the cut pieces slightly and again roll it delicately with the cut piece facing up. Repeat with all the puris. Heat ghee and deep fry the rolled phenori on both the sides until crisp and light brown. Once it warms a little bit dip it in sugar powder on both the sides,dust the extra powder and arrange it in a plate. Once cooled completely store it in an airtight container. You may make 3 layered,5 layered or even 7 layered phenoris. With this batch, few I did with 3 layers and few with 5 layers. Small phenoris looks cute and can be relished at one go. 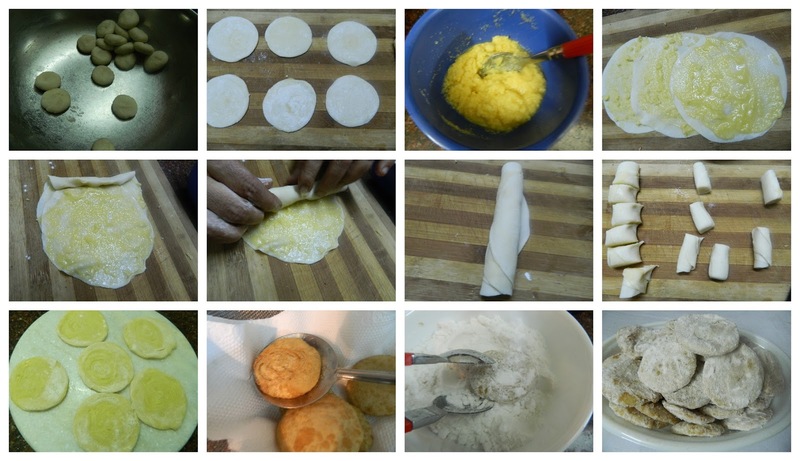 The puris should be rolled thin for better results. Chiroti mixture is applied for crispier result. Few soak the phenori in sugar syrup,but I prefer this method. If the phenoris are not fried properly it will become soft. (personal experience). Don’t press the phenoris at the centre too much while rolling it.